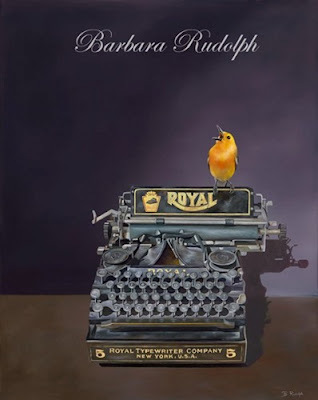 Barbara Rudolph Fine Art: Royal Typewriter Painting with Warbler "Tell Me A Story"
Royal Typewriter Painting with Warbler "Tell Me A Story"
Everyone loves a good story﻿ and this little "warbler" is waiting for one more to be told. This old "Royal Typewriter" belongs to a writer friend of mine, and when I saw it last summer I decided that I had to paint it. I photographed it from many different angles and then selected a simple position to paint a very complicated work in oil. I always paint a little "bird" into my paintings and this little "bird" seemed perfect for the composition. This painting took many months to complete and is for sale now at the "Celebration of Fine Art" show in Scottsdale, Arizona. If you would like more information about this painting please contact me, and see more on my website.